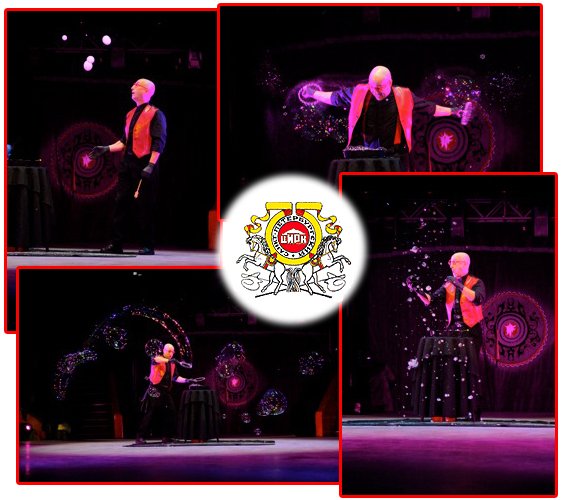 Adding yet another light-as-a-feather bubble to his cap of accomplishments, Casey Carle presented his effervescent talents and directing skills for the attendees of The Russian State Circus in St. Petersburg, Russia, in late September 2010. This international event, entitled "Planetary Carnival of Stage Direction", was a judged competition of new and cutting edge circus presentations and routines. The first of its kind circus competition that emphasized "presentation" over all other aspects of performance, with an emphasis on directing, costume and music - those things that the most strict judges of any artists - the audience - pays attention to. It was held in the oldest and first stationary circus of Russia, an architecturally stunning building of the late 19th century built in the heart of a city that in Soviet times was known as Leningrad. Grigoriy Gaponov, Art Director of the Saint Petersburg Grand State Circus described the production as "a landmark event not only for Saint Petersburg but for the country as a whole, presented in the renowned arena of one of the greatest circuses in the world." Mr. Carle's act was one of many presented to thousands of enthusiastic circus attendees and scored for competition by a jury of famous Russian circus veterans, TV celebrities, politicians and artists. Of the 30 plus acts presented in the opening rounds of competition only the top dozen or so were chosen for the Grand Gala evening of circus theater attended by top dignitaries, high-profile members of the Russian circus community, and circus producers from around the world who were looking for new creative ideas. Mr. Carle's soap bubble comedy and artistry earned high marks from the panel of judges (as well as ebullient praise from the crowds filling the arena) and was, therefore, one of the acts chosen for The Gala Presentation Show, at which he was recognized as the best act from America and presented - in front of thousands of cheering fans - an award of a large bouquet of flowers and multiple gifts from the U.S. Consulate General's office based in St. Petersburg. Mr. Carle began his bubbly career as a member of The Ringling Bros, Barnum & Bailey Circus in the late 1980s. This event in Russia marked his return to the center of a circus ring to cheers and accolades of a society steeped in circus history and tradition. A proud moment in his career and one that has already garnered him a 6 week engagement at the Conneli Circus in Zurich, Switzerland for the 2011 holiday season.